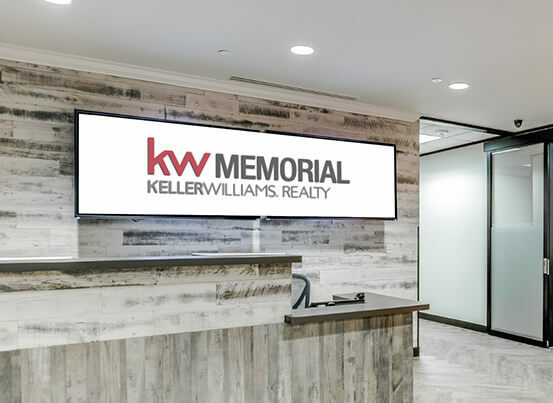 KWMemorial.com is a well-established real estate brand with global name recognition that has been serving local community in Houston, TX since 1989. Keller Williams Memorial’s 700+ agents proudly provide their community with any type of real estate service. 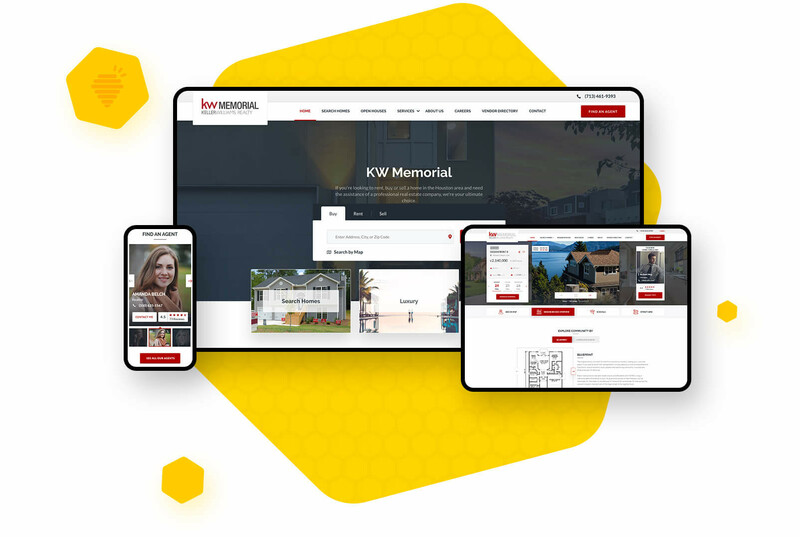 Real Estate Bees web design team’s main objective was to come up with a visually-appealing, engaging, user-friendly, authentic, and trustworthy design that will help project KWMemorial.com website as an authoritative local real estate company. Also, we needed to figure out how to dramatically increase the amount of a highly qualified inbound seller, buyer and recruiting leads to keep the company consistently growing. In addition, we started thinking how we could add additional revenue streams and increase Keller Williams Memorial’s profitability. Finally, we wanted to wow everyone in their office including executive leadership, staff members and agents as well as their customers. Real Estate Bees’ web design team came up with an authoritative, beautiful, engaging, user-friendly, highly-converting and lead-generating website design that instantly established KWMemorial.com website as a local market expert. We came up with a user-friendly, visually-appealing and information-rich layout design for neighborhood and city pages where KW Memorial brokerage provides their clientele with useful local information thereby positioning itself and their agents as a local market experts. Countless hours have been spent on developing a back-end system that integrates with the leading national home service providers’ platform Youthful Home, which opened up a brand new monitization opportunity for KWMemorial.com and created an additional revenue stream. Real Estate Bees' website design team starts each project with a thorough approach by creating a clear and thought-through prototype of every single page on the website. This way our customers will have an idea how their future website's structure will look like. Real Estate Bees' website design team comes up with matching colors, fonts and other important visual elements that will match client's overall branding. Real Estate Bees knows how important it is to allow your visitors to conveniently search for properties right on your website. Our team took it to the next level and developed an extraordinary property search experience for Keller Williams Memorial's visitors that's integrated to the local MLS database. Our talented web marketing team along with creative web designers came up with a beautifully-designed property page that allows KW Memorial brokerage to capture qualified leads and distribute them among their agents. Our talented web design team came up with a creative solution for KW Memorial's request to showcase their valuable agents in a unique way. We designed an appealing, content-rich & personable profile pages for their agents. In addition to agent profile pages, KW Memorial executives asked us to also showcase their teams in an authentic and trust-worthy way. We took on this challenge and came up with an incredible solution to showcase their valuable teams. Real Estate Bees' digital marketing team realized that in order to position KWMemorial.com as a local market expert, they had to offer to the local community a top notch local content. Our team of website designers skillfully designed one-of-a-kind layout for neighborhood & city pages that allowed KWMemorial.com to become a local go-to market expert. Countless hours have been spent on developing a back-end system that integrates with the leading national home service providers' platform Youthful Home, which opened up a brand new monitization opportunity for KWMemorial.com and created an additional revenue stream. At Real Estate Bees we understand the importance of a thought-through, engaging and user-friendly design throughout the entire website. Therefore, each page's design is crafted with individual specifications and functionalities in mind to provide the best possible experience to your visitors. Our talented web design and development teams understand the importance of having fully-responsive website design. We're aware that from year to year mobile traffic increases and not mobile-friendly designs are no longer an option. All of our designs are fully-responsive on all the popular devices and compatible with all the major browsers.